The Sacrament Reconciliation (commonly called Penance, Reconciliation, or Confession) is one of the seven sacraments of the Catholic Church, in which the faithful obtain absolution for the sins committed against God and neighbor and are reconciled with the community of the Church. By this sacrament Christians are freed from sins committed after Baptism. 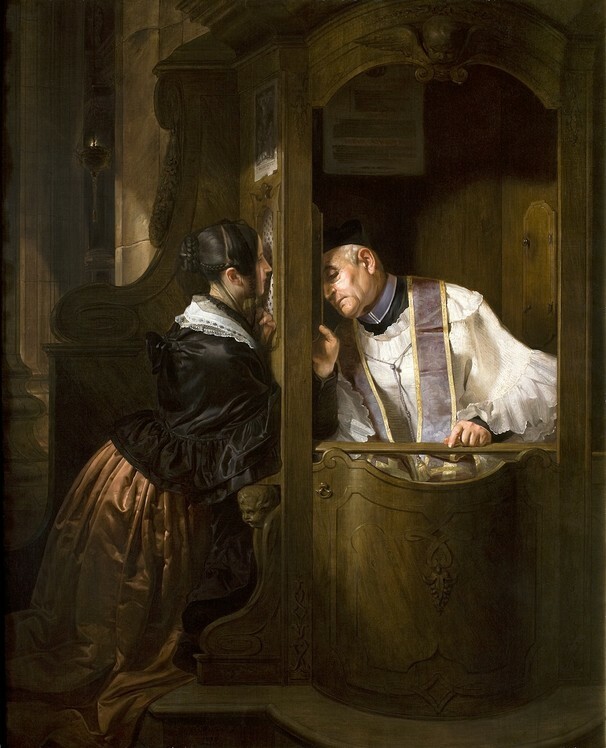 The sacrament of Penance is considered the normal way to be absolved from mortal sin. The Scriptural basis for this sacrament is found in John 20:23, where Jesus breathed the Holy Spirit into the Apostles, saying, "Whose sins you shall forgive, they are forgiven them; and whose sins you shall retain, they are retained," and to James 5:16: "Confess therefore your sins one to another: and pray one for another, that you may be saved." Schedule : Saturdays 3:30pm - 4:30pm in the church, or in extraordinary circumstance by individual appointment with a priest (805) 646-4338. *We also hold a special Communal Penance Service each Lent and Advent where many priests will be available for private confessions. Please listen to announcements at Mass or watch the bulletin for details during that time.